Forcefield™. Protective headgear that looks and wears like a sweatband. FIFA compliant. ASTM tested. NFHS Listed. CE II approved. Proven effective in over 15 non-collision sports, leisure activities and medical applications. Recommended by medical professionals and brain injury experts in Canada and around the world. The only headband in the world marked CEII, certified as protective headgear is now available in Canada. We believe that Canadians will find new uses for Forcefield Protective Headgear™. Canadians participate in sports and activities like the rest of the world, and we also have activities uniquely and popularly Canadian. So we're giving away FREE ULTRAs in exchange for your ideas. Good luck! 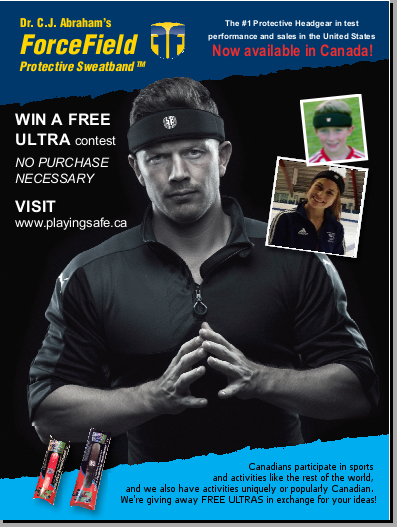 Forcefield Protective Headgear™ Contest (WIN-A-FREE-ULTRA contest) is being held online at www.playingsafe.ca. The WIN-A-FREE-ULTRA contest rules are available whenever you click on a Win a Free ULTRA icon scrolling along the bottom of the home page. The contest runs from October 1, 2015 - July 31, 2016 and from September 1, 2017 - August 31, 2018. Each year, 10 Forcefield Protective Headgear™ ULTRA headbands will be given away. The retail value of a Forcefield ULTRA™ is $35. No purchase necessary. You may submit only one contest entry a month. Who can enter. The WIN-A-FREE-ULTRA contest is open to all Canadian residents, age of majority and older. Parents and legal guardians can enter the contest once a month for each member of their household over the age of 4. Contest entries will be accepted in either or both Canadian official languages. How to Enter. Think about a sport or activity where it's important to protect your head from getting hurt. Then write down a two (2) sentence description of a use for Forcefield Protective Headgear™. The first sentence is the sport or activity. The second sentence is about the risk of injury and why protecting your head during that activity is important. The benefit must be based on the Forcefield Protective Headgear™'s ability to significantly reduce the force of an impact. For example, I would use my ULTRA when curling. I might slip and hit my head on the ice. Do not pick an activity where helmets are already standard equipment. All entries must include 1) type of use and why it's important 2) your full name and address, another name and his/her age if he/she is a minor 3) your size choice. For example, If I win, please send me the ULTRA JR. Note: ULTRA JR fits 4-12, ULTRA ADULT fits teen to adult. Judging. This is a contest of skill, not of random chance. The odds of winning are based on the number of contest entries received each month and the entries are judged on merit: The ability to communicate an appropriate use and benefit creatively and effectively improves your chance of winning. Originality, for example if the use is not already listed on the website, also improves your chance of winning. A winner is selected each month from among the entries received from the preceding month. Where to enter. DROP OFF at your local sports store, wherever you see the win-a-free-ULTRA sign. Or submit your entry by email: win-an-ultra@forcefieldheadbands.ca Or by mail to TransCanada Network, WIN-A-FREE-ULTRA CONTEST, 6007-2100 Bloor St W, Toronto, ON M6S 5A5. Click here to enter online. The winners will be contacted by email or regular mail. The winner will receive their choice of Forcefield ULTRA™ junior or adult size. The winner's name and initial, city, province and suggested use (in full or in part) and winning ULTRA size selection will be published on this web page and may be used elsewhere for publicity purposes. A list of the most popular uses can be found by clicking each of the menu items on the grey bar at the top of the www.playingsafe.ca website. In addition, current uses can be found by clicking on the intermural and leisure menu items. Your suggested use must not include a prohibited use. Prohibited Use. Forcefield Protective Headgear™ is not for use in sports and activities where a helmet is standard equipment. If you think of a sport, activity or use where you'd wear a Forcefield ULTRA™ and why you should consider protecting your head during that sport or activity, and you meet the eligibility criteria above, you may enter the WIN-A-FREE-ULTRA contest. This contest is run by the TransCanada Network, the licenced importer of Forcefield protective headbands™ in Canada.The contest is not open to employees, representatives, agents, service providers nor family of TransCanada Network. The WIN-A-FREE-ULTRA contest will close and re-open monthly on the last day of the month at midnight. Submissions will be judged on merit and the winner selected solely at the discretion of TransCanada Network in Ontario, Canada. All decisions are final. Winners will be mailed, by Canada Post, their free Forcefield ULTRA™ within 30 days of being declared a winner. Incomplete contest entries may cause a delay. Be sure to review your contest entry for completeness. We reserve the right to award more than one winner in a month if we do not receive any eligible entries the prior month. If we are unable to deliver the Forcefield ULTRA™ you select, we reserve the right to award a similar prize of equal or greater value, or, at our discretion, the cash value of the Forcefield ULTRA™. Winning entrants release the WIN-A-FREE-ULTRA contest organizers, employees, agents and representatives from any liability for any damages they could suffer owing to the acceptance or use of the prize and acknowledge that the only warranty applicable is that of the terms and conditions on the www.playingsafe.ca website. To be declared a winner and prior to obtaining the prize, the selected entrant or their parent or legal guardian will be asked to sign a winner's declaration. Entries are subject to verification. Your entry could be disqualified and not included in the WIN-A-FREE-ULTRA contest for not being complete, being illegible, fraudulent, does not include identifying information, includes a use that is prohibited, if you do not comply with these rules or if you send in more than one entry during the same calendar month. Your WIN-A-FREE-ULTRA contest entry must include these 3 things: (1) Two sentences, (a) type of use, sport or activity when you'd wear your Forcefield ULTRA™ and (b) why protecting your head during that activity is important (2) your full name and address (3) the size of Forcefield ULTRA™ you want if you win. Forcefield and Forcefield Protective Headgear are registered trademarks of Forcefield FF (NA), Ltd., registered in the United States and in other countries. Congratulations WIN-A-FREE-ULTRA Forcefield Protective Headgear™ contest winners !!! 6. March 2016: Manny B. and his sons think headbands under their toques would make their paper route 'complete the street' competitions less risky on icy Winnipeg MB winter afternoons. 7. April 2016: Edward S., from Sunset Prairie British Columbia reports that maintaining equipment, buildings, fencing and caring for cattle pose safety risks on the farm. He'd like to reduce the risk of a head injury from a fall. 8. May 2016: Neurosurgeon's daughter, Anna N. from London Ontario knows there is risk of concussion and even permanent brain damage when playing fast paced sports like her favorite, basketball. She wears a mouthguard and kneepads and would also like to protect her head in case she takes a tumble. 9. June 2016: Nick L. plays competitive soccer in Toronto, Ontario with one brain and a long life to live. 10. July 2016: Goalkeeper Jasmine P. says she's been kneed in the head more than once and while she plays to avoid collisions, she wants to give her head some extra protection. 11. August 2016: Daughter Candace C. on behalf of her mother: We looked into martial arts helmets but mom won't wear them because of the way they look. This is a great alternative. 12. September 2016: 5'11'' University basketball recruit Kelsey R. wants to share the importance of protecting yourself in sport. We're accepting entries for our next contest, September 2017-August 2018. Good Luck! 1. September 2017: Curler Lise B, likes feeling safe on the ice, "Je me sens en plus en sécurité". 2. October 2017. Competitive cheerleader Stephanie K. wants to set an example for all athletes. She feels it's most important to protect her brain while being thrown high into the air, tumbling at lightning speeds, and sharing the floor with 20 fast-moving teammates. 3. November 2017: Trinity L. loves everything about playing soccer except being hit in the head with the ball. 4. December 2017: Mom, Mary E. says, head protection is non-negotiable... even after CanSkate level 5. 5. January 2018: Ice arena ops supervisor, Andre S. is looking forward to compliance following the maintenance crew protective headgear mandate in Alberta. 6. February 2018: Mother, Kerri-Ann W wants to protect her active boys, ages 5 and 7 during play. They've already taken hits to the head and she'd like to make sure their brains are protected from now on. 7. March 2018: Curling coach Scott C. says concussion is a very real risk for his Ontario high school curling team and would like to help mitigate this risk in a way his students will accept and wear. 8. April 2018: Taya J.,U16 center midfielder and SWO Storm U Tour Team says her soccer instinct is to head the ball, it's part of the fun of the game. She says her brain is what is going to take her forward so she wants to protect it. The importance of protecting her head and her brain was brought to the fore when Taya's uncle, Chris, a top amateur and professional boxer, suffered a blood clot in his head and almost died. 9. May 2018: Grandpa Rick C from BC wants his 3 active grandchildren to be better protected at play. While his 6 year old grandson is no longer racing down the hall and falling into closed doors, both he and his 3 year old sister can get distracted and collide with hard objects or each other. Rick also wants to do everything he can to help his 9 year old granddaughter play safe during her first year of soccer. 12. August 2018: Alan M., a veteran curler from Ontario doesn’t think you can ever be too good a curler to be free from the risk of a fall. He thinks it’s especially important for seniors to wear a head protector while curling because the ice is hard and if there’s nothing between your head and the ice in a fall your skull will absorb all the impact. Also, since many seniors take blood thinners, there’s the added risk that a blow to the head could result in a hemorrhage. Alan has seen many falls over the years, even by a high-level instructor, also when putting away rocks after an end and a rock is sent to someone’s feet (bowling them over), when concentrating on sweeping and your ankle turns, the gripper loses contact with the ice and your feet go out from under you. He’s even seen sweepers get tangled with each other, lose their balance and fall.